SkyFire, the app that lets iPhone users view Flash video on their phones, has managed to generate a cool $1 million in its first weekend on sale. 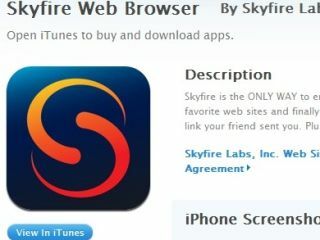 The SkyFire app for iPhone costs $2.99 in the US and yet is still not officially available on the UK iTunes Store. However, reports from the jailbreak scene indicate that there are plenty of British users with jailbroken iPhones already happily using the Flash app. SkyFire is available for free on all other smartphone platforms, but that is clearly because those platforms already offer Flash video support, unlike Apple's iPhone. The company told MobileCrunch that its download numbers for their first weekend on the US iTunes store were 2well over 300,000." After Apple takes its 30 per cent cut, this means that SkyFire walked about with somewhere between $600,000 to $700,000. Not bad for a weekend's work! The iPhone app has suffered a few teething troubles in its first few weeks on sale, with SkyFire putting this down to the huge demand for Flash on iPhone from its customers.